Learn the origins of fairytales with this 1 weird trick! « Nothing in Biology Makes Sense! The origin, spread and alteration of these stories in human history has some parallels with the evolutionary processes of migration, drift and mutation, and so it seemed natural to Tehrani to try to resolve the historical connections among these stories using statistical methods developed to make inferences using biological data. In order to do this Tehrani tallied up the similarities and differences between between 58 variants of the stories for 72 characteristics (e.g. the identity of the villain, whether there is a single child several…) and subjected them to several varieties of phylogenetic analysis (including a network analysis, which is meant to elucidate transfers of characteristics between distinct variants). These analyses produced trees that supported the distinctness of Riding Hood and The Wolf and the Kids and found that the African tales are closely allied with Riding Hood. The author suggests that the close connection between the African and European stories may have arisen through migration as a result of European colonization of Africa. 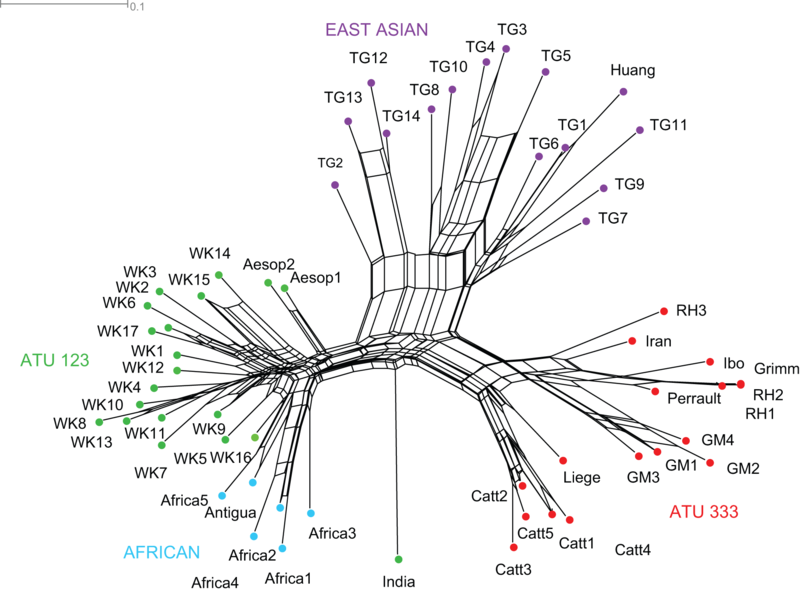 Interestingly, the network analyses suggest that the Asian Tiger Grandmother tales may be a result of blending with the Riding Hood and Wolf and the Kids stories, though the author leaves open the timing and location of this “hybridization” event. All in all, a cool paper, and a great opportunity for this focused evolutionary biology postdoc to stray a bit from his normal academic habitat. This entry was posted in cultural evolution, phylogenetics and tagged fairy tales.